The New Orleans Pelicans want to make sure their massive trade asset is fully healthy heading into an important offseason. 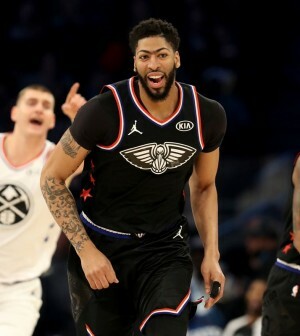 The team confirmed that they will put a strict limitation on the amount of minutes Anthony Davis plays for the remainder of the season in order to ensure he is healthy enough to maintain his trade value for potential suitors in the summer. “You will see a reduction in Anthony’s minutes,” said interim general manager Danny Ferry. Davis, who formally asked to be traded by the team in late January, left the team’s last game before the All-Star vs the Thunder after sustaining a shoulder injury. Instead of sticking around to witness the rest of the game, he and agent Rich Paul left the building before the second half of their 131-122 win on February 14. In his seventh season with the franchise, Davis is averaging 28.1 points, a career-best 12.1 rebounds, and 4.2 assists in 45 games. Following the 2018/19 season, he will still have one-year, $28,751,775 left on his current deal before he is eligible to become an unrestricted free agent in the summer of 2020. The Pelicans are currently six games back of the eighth seed in the Western Conference with a 26-33 record.